At first glimpse, it looks different ! ~ not the ones, we have in mind !! Adelaide is the capital city of the state of South Australia, and the fifth-largest city of Australia. Named in honour of Adelaide of Saxe-Meiningen, queen consort to King William IV, the city was founded in 1836 as the planned capital for a freely-settled British province in Australia. Colonel William Light, one of Adelaide's founding fathers, designed the city and chose its location close to the River Torrens, in the area originally inhabited by the Kaurna people. In 2008, Virender Sehwag hit a blistering 151 at Adelaide denying Australia a victory. Cricket has been played at Adelaide for too long – since 1884, it has hosted International cricket test every summer along with many One dayers…. Monarto Zoological Park is administered by the Royal Zoological Society of South Australia. Monarto, is approx. 70 kilometres (43 mi) from the Adelaide city centre. It features several unique attractions, including a drive through cheetah habitat, a southern white rhinoceros habitat, and Australia's largest giraffe herd. The white rhinoceros or square-lipped rhinoceros (Ceratotherium simum) is the largest extant species of rhinoceros. There is another species – the northern subspecies has very few remaining, with only four confirmed individuals left –one of them is Sudan, on whom I had posted one recently highlighting Rohit Sharma’s visit to Kenya and supporting the project. At 42, Sudan is old – one to have lived in captivity and his age beginning to show. When Sudan was born in 1972, there were more than 1000 of his ilk roaming the jungles of Central Africa ~now they are reduced to less than fingers in hand. A popular theory of the origins of the name "white rhinoceros" is a mistranslation from Dutch to English. The English word "white" is said to have been derived by mistranslation of the Dutch word "wijd", which means "wide" in English. The word "wide" refers to the width of the rhinoceros' mouth. An alternative name for the white rhinoceros, more accurate but rarely used, is the square-lipped rhinoceros ~and the birth of a new adorable white rhino at Monarto zoo is the subject matter of this post. 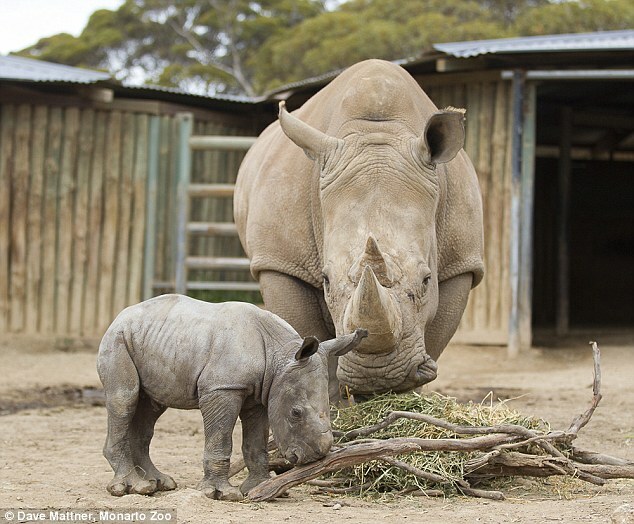 The Zoo news and other press report of a southern white rhinoceros calf being born in the Monarto zoo, Adelaide. The female rhino calf, who is yet to be named, was born in the early hours of Saturday at the open-range Monarto Zoo, south-east of Adelaide. Zookeeper Haidee Kinter said the birth represented hope for the long-term survival of the endangered mammals. 'Everyone's thrilled to welcome the new calf to the Monarto rhino crash - it's especially exciting for zookeepers to see the animals they care for healthy, happy and breeding,' Ms Kinter said. 'It's hard not to fall in love with these amazing animals.' Poaching of the southern white rhinos has been on the rise in their natural habitat, South Africa, with more than 1,200 killed in the region in the past year. 'We must increase our efforts to safeguard and breed rhinos in protected places like zoos and wildlife sanctuaries,' Ms Kinter said. Zoo authorities report that the mother and daughter will remain in a private area of the rhino facility until she has reached a sociable age. The zoo hopes to increase their efforts to safeguard and breed southern white rhinos in protected places like these wildlife sanctuaries. Visitors are expected to be able to see the calf at Monarto Zoo, which is home to six other southern whites, in the coming weeks. The zoo's crash - the collective noun for a group of rhinos - also consists of two bull males, Satara and Ibutho, two adult females, Umqali and Uhura, and juvenile female Kibibi. The zoo is also expecting the birth of two baby chimpanzees before the end of October. 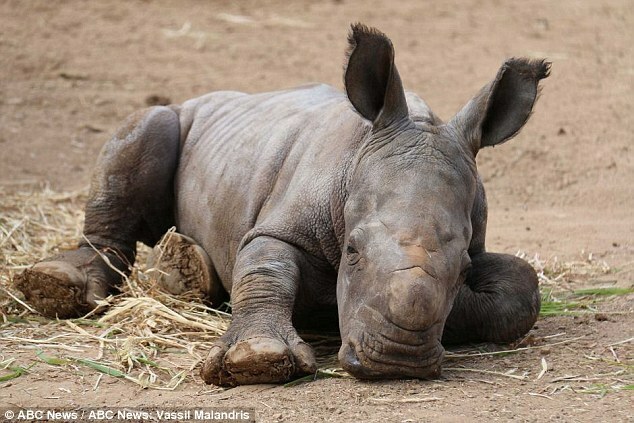 The new born rhinos can range between 40 to 60 kg in weight, while adult females can grow to 1,800 to 2,000 kg. This new calf born to Umqali is the star attraction as of now.